Price: $99. There is no DIY option for this item because the welding and machining are minimal. Stephen- How do I order an ejector and account for the freight to NJ? Just send me an email and include your zip code. Would be nice to have parts listed in your post could you do that PLS ? Hi Hugues…The sad fact of life is that the only money I have to do wood gas projects comes from selling wood gas items. Unemployment is no fun. That is why I don’t post parts lists and dimensioned diagrams. By retaining some stuff to sell I can keep innovating and showing people stuff that works. At least it gives them a working direction to go, like the Gas Station cooler design. It’s the best balance I can come up with until I can land another job. Can you explain the connections, one is woodgas inlet and one the plastic tube is compressed air? but what is the third with the ball valve is it just a extra air and needs no hookup? What psi are your running it at? Do you ship overseas to Sweden? Hi Andreas….You are close. 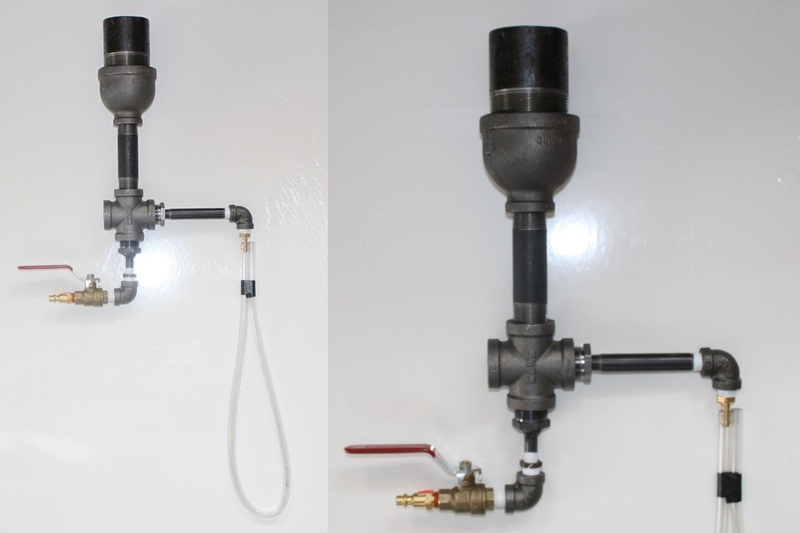 One side of the pipe cross is the gas inlet, the other side(plastic hose) goes to a water manometer to measure the system suction, and the ball valve goes to a compressed air supply. Everything needs to be connected. I run 120psi into mine. I do ship overseas and I have a unit on the shelf. I will send you a quote tomorrow. is it possible to create a strong enough vacuum using a blower rather than compressed air? I feel Stephen’s method is elegant. It does away with the cleaning of the blowers every time they clog.